When I first started working at UC Davis, my building was on “California Avenue”. There were a few buildings opposite, one of which was a wooden building in the same style as many others on campus (such as The Barn). I’d only just started obsessing about sketching buildings in Davis and said, yeah, I will sketch that some day. I never did, and then it was knocked down, and they started construction on a new building, one that the Geology Department would move into from their previous home in the Physics building. California Avenue is now “Crocker Lane”. Geology is now “Earth and Planetary Sciences”. Pete is now “40”. 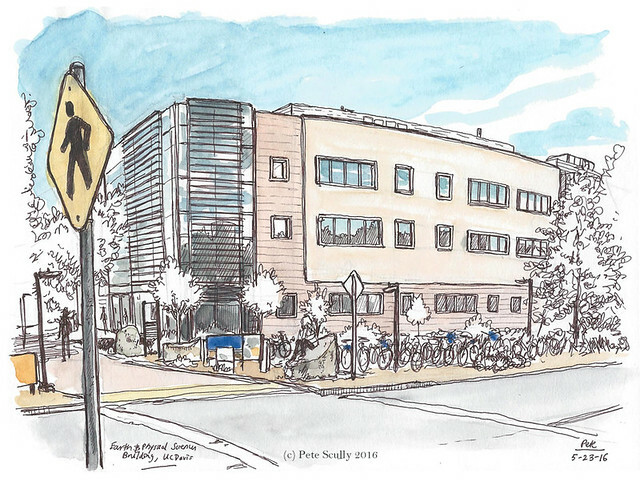 So, this week I finally got around to doing a sketch of the Earth and Planetary Sciences, aka “EPS”, building. It’s a nice modern building, and has an interesting collection of rocks planted around the outside. My son (who loves geology) enjoys going out and looking at them when he comes to visit my office. This is literally the School of Rock.